The Laotian consumes around 345 lbs of kiao niaw, or white sticky rice, per year that make Kiao Niaw the typical dish in Laos cuisine. 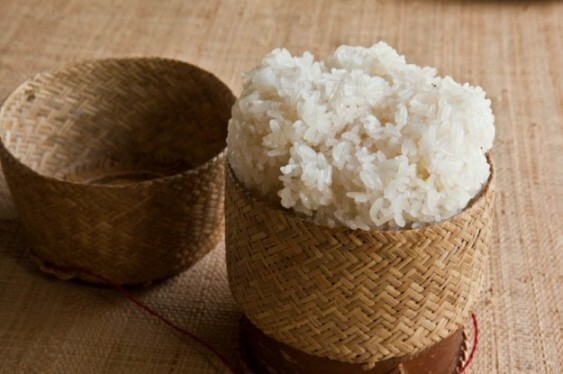 Since sticky rice takes longer to digest than regular steamed rice, people can go longer without eating, which in an agrarian society like Laos, is very important. Kiao niaw is eaten with the fingers, by first rolling it in the hand and then dipping it into other foods or sauces. Variations include brown sticky rice or sticky rice cooked inside a bamboo tube. 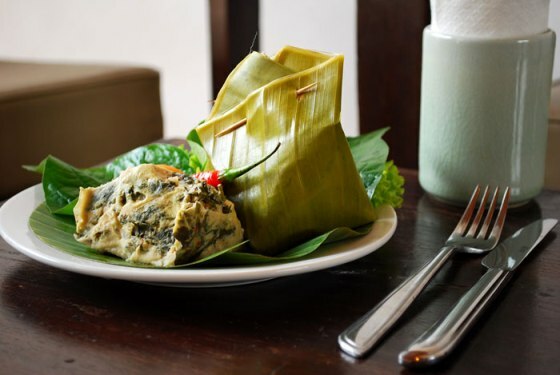 A delicious Lao fish recipe originating from Luang Prabang, mok pa is an aromatic mixture of onions, garlic, and herbs enveloping slices of fresh fish filets wrapped and steamed in banana leaves. As one of the national dish of Laos food culture, you can find Mok Pa in restaurants or Laos street food. For those who dislike spicy food, this is a dish worth a try! 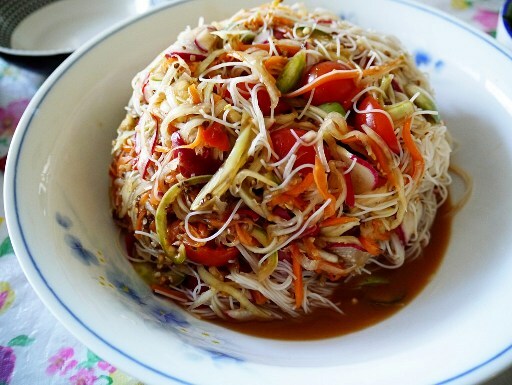 It is not unusual for locals in Laos to consume fruits at various stages of ripeness, and from this tradition, green papaya salad was created. Visitors to Thailand may already be acquainted with the dish, as it is widely believed that it is in reality originated in Laos. This noodle dish is often compared to the Pho dish of Vietnam. Khao piak sen is a noodle soup served with either beef or chicken in a bowl with broth over flat rice noodles and garnished with herbs. Yall Dib are the Lao version of fresh spring rolls, somehow the same as what can be found in Vietnam. Traditionally, the spring rolls are made by wrapping rice noodles, herbs, and choice of meat in a thin rice paper. The most common dipping sauce used for the spring rolls is a chili and peanut mixture. 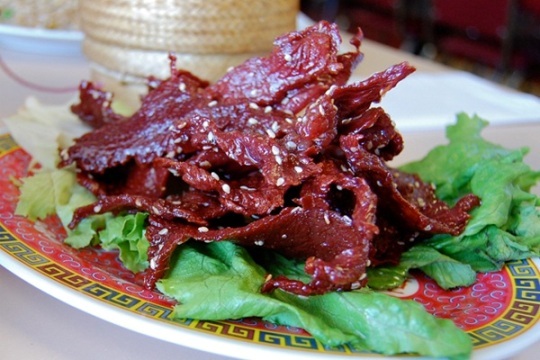 Sien Savanh are small bites of beef, marinated in garlic, pepper, palm sugar and soy or oyster sauce, and then sprinkled with sesame seeds. The marinated beef is left to dry in the sun’s rays to find the perfect glaze. To finalize the product, roadside street vendors will grill the beef jerky to add a smoky flavor, resulting in the Lao version of beef jerky. This potent rice whisky (roughly 40% proof) is a popular liquor often found in rural areas of Laos. The whiskey is made from distilling sticky rice and crumbles of yeast balls, which results in a clear, strong liquid that tastes a little bit like day old bread. For the more adventurous tourists, there are exotic blends with lizards, snakes and scorpions available to test. Laos produces more than 20,000 tons of coffee per year, so it is no surprise that coffee is a popular drink in the region. Robusta is used for most coffee drinks, and similar to Vietnamese style, is drank with sweet condensed milk.